Bidets, much like most things in life, come in different varieties. Some, like hand-held bidets, are fairly utilitarian, facilitating cleansing without much frills. Others, however, can bring creature comforts right to your toilet seat in more ways than you can imagine. Top-of-the-line bidets offer much more than hygiene and a thorough cleansing, incorporating numerous functions that make those trips to the toilet a truly pleasant experience. 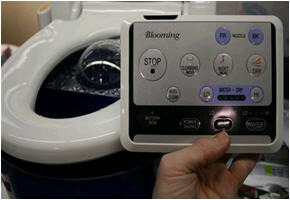 While enhanced operation doesn’t come cheap, neither does the well-being a full-featured electronic bidet can bring. The moment you sit down, you can relax in a heated seat that keep your bare legs warm, taking as much time as you need without the need to hurry. Pick up the wireless remote control to perform any action with the single press of a button, whether it’s adjusting your seat’s temperature for a more restful feel or activating the powerful deodorizer to get rid of unwanted smells. High-end bidets offer a complete set of self-adjusting sensors that can deliver the necessary cleansing – from the heat of the water to the pressure with which it’s delivered – depending on numerous factors. You can also choose to override any predetermined setting and program it according to what works best for you. Pampered is pretty much the operative word, with the warm aerated stream of water during cleansing and the soft gush of warm dry air while drying. Many even offer cyclic massaging during cleaning to facilitate a more thorough and relaxing rinse. Costing in the vicinity of $500 and up, high-end toilet seat bidets may prove a considerable investment. However, that easily pays for itself in the improved quality of both your family’s hygiene and cosiness during what’s usually uncomfortable moments.